The Powder & Bulk Solids Conference is designed for both new and experienced processing professionals. 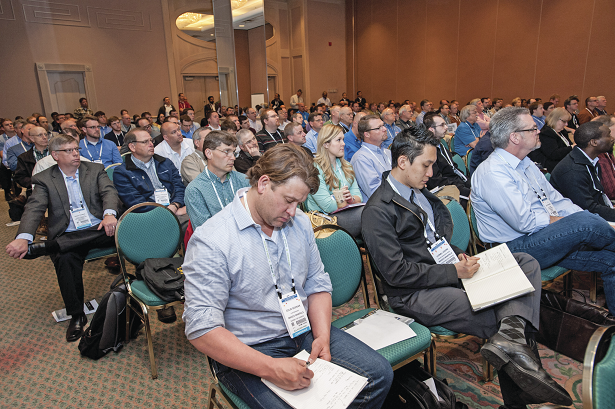 The program for the International Powder & Bulk Solids Conference, April 24-26 at the Donald P. Stephens Convention Center in Rosemont, IL, is crafted with input from an advisory board full of industry experts. Designed for new and experienced processing professionals to learn the latest in safety, efficiency, and compliance, this flexible conference program provides in-depth technical training to help attendees brush up on the fundamentals or tackle more advanced topics. This year's conference program provides an impressive range of training and education. The program kicks off Tuesday, April 24, at 9am with a keynote panel discussion on dust collection and dust explosions, with Dr.-Ing. Johannes Lottermann, director explosion safety, REMBE Inc., moderating a panel that includes: Ashok Dastidar, VP, dust & flammability testing and consulting services, Fauske; Vahid Ebadat, CEO, Chilworth Asia Pacific; Craig Froehling, engineering lead - worldwide grain, Cargill; Jack Osborn, PE, Airdusco; Bill Stevenson, VP - engineering, CV Technology. Safeguarding Explosion-Prone Installations: Prescriptive vs. Performance-Based Approaches, led by Dr.-Ing. Johannes Lottermann, director explosion safety, REMBE Inc. Basics and Applications of Particle Characterization, Remi Trottier, scientist, The Dow Chemical Co.
Key Essentials to Food and Nutrition Powder Blending, Steven Wicklund, account manager, Tetra-Pak Inc.
How Proper Silo Design Can Prevent Silo Failures, led by Joe Marinelli, president, Solids Handling Technologies Inc., and Gary Chubb, executive director & founder, Chubb Engineering. Day 2 of the conference, Wednesday, April 25, begins at 9am with a keynote panel discussion on pneumatic conveying, led by Prof, Mike Bradley, University of Greenwich, UK, and consisting of Jack D. Hilbert, principal consultant, Pneumatic Conveying Consultants LLC, Professor Mark Jones, PhD, director, TUNRA Bulk Solids, University of Newcastle, Australia, Joe Marinelli, president, Solids Handling Technologies Inc., Jonathon Thorn, executive director of process technology, Schenck Process, as well as a representative from Coperion K-Tron. A panel on Driving the Greatest ROI in Scaling up Automation in Food Factories, consisting: David Rose, managing director, Spiroflow; Andrew Eddleman, applications engineer, Acquire Automation; and Bill Werra, VP corporate strategy, Sentry Equipment. Understanding the Issues with Level Measurement and How to Correct Them, Herman Coello, product marketing manager - level technologies, Siemens Industry Inc.
Volumetric and Gravimetric Feeder Design to Ensure Reliable Flow, Joe Marinelli, president, Solids Handling Technologies Inc.
Day 3 of the 2018 Powder Show Conference, Thursday, April 26, begins at 9am with a keynote panel discussion: Mixing, Sampling, Segregation, led by Eric Maynard, senior consultant/director, Jenike & Johanson, and including Joe Marinelli, president, Solids Handling Technologies Inc., Professor Michael Bradley, University of Greenwich, UK, John Liffiton, senior principal food process engineer, Glanbia Performance Nutrition, and Bruno Hancock, Pfizer. Material Storage Fundamentals, Joe Marinelli, president, & Scott Miller, senior consultant, Solids Handling Technologies Inc.